Trying to keep warm? While the snow falls outside, how about gathering friends around a roaring fire inside and try some ice wine? If you’ve never tasted ice wine (icewine–one word in Canada), perhaps winter is a good time to try it. Contrary to it’s name, ice wine will help your “insides” warm up after a few sips primarily due to the high sugar content. Yep, it’s pretty darn sweet and, to me, almost thick. Appreciating the taste of this wine is helped by understanding how it is made. Ice wine comes from grapes that have frozen on the vine and then been harvested. As the grapes are crushed, the ice is left behind with the other solids-the skins and seeds. To give you an idea of how concentrated the juice is: If the sugar content of the juice was 22 percent when pressed normally, it would be 50 percent or more after freezing and pressing. There are strict requirements for the “brix” which is the sugar level in the grapes. Harvesting takes place by hand in the early cold morning hours when acidity levels are at their highest. Pressing produces only tiny amounts of juice-one reason for the extremely high prices of ice wines. * Canada, is the world’s leading producer of icewines (Germany is second). Our neighbor, Ontario, is the center of production. Anyone who’s visited the Niagara Falls area has been close to icewine country. Not to be confused with “late harvest wines.” (So much to think about in this world of wine, isn’t there?!) The term late harvest means what it says– that the grapes were picked late in the harvest season when they had ripened past the sugar levels required for ordinary table wine. They are known for their rich, honeyed flavors. To me, they seem to be less dense than ice wine. In general, I’ve never been a fan of dessert wines. I’m not a port drinker nor do I care for the extreme sweetness of ice wine. I have always claimed not to like sweet wine. But, I must confess, I became a believer when I tasted the “liquid gold” of Far Niente’s Dolce. (“Dolce Far Niente” translates to “the sweetness of doing nothing.”) Dolce is a late harvest wine (blend of Semillon and Sauvignon Blanc) and, therefore, has a bit of that higher sugar level. It is very, very smooth. The “wow” factor I first experienced with it came at a pairing with a bleu cheese (which I never liked by itself). It is definitely an after dinner treat and goes well with chocolate and crème brulee. Dolce, then, is my first recommendation this month. (Around $85 for 375 ml.) And, by the way, the bottle is very pretty. My other recommendation is also not an ice wine—it’s French late harvest. It’s a Sauterne (late harvest) and it’s the same Semillon/Sauvignon Blanc blend from France. Le Tertre Du Lys D’Or isn’t Dolce but it’s worth a try. (If that isn’t available, another alternative is Chateau Villefranche Sauterne.) Both of these are about $20-25. Recently one of our readers, McKenzie, posted a question about the difference between American and French Oak. You’ll see above on the bottom part of the label, it shows one barrel was Centre Sylvain French oak and the other was Missouri U-stave American oak. The wine is a bit on the expensive side. Our price was $125 a bottle. We tasted this wine at dinner where I had filet and my wife had short ribs, so the wine would pair with the food properly. On the nose – we both thought the American oak was a little stringent with hints of perfume and paint(!) while the French had some leather and cigar tones. Winner. French! On color, clarity and body – the wines were equal and no one was clearly better. This is probably because the juice was the same. Both! 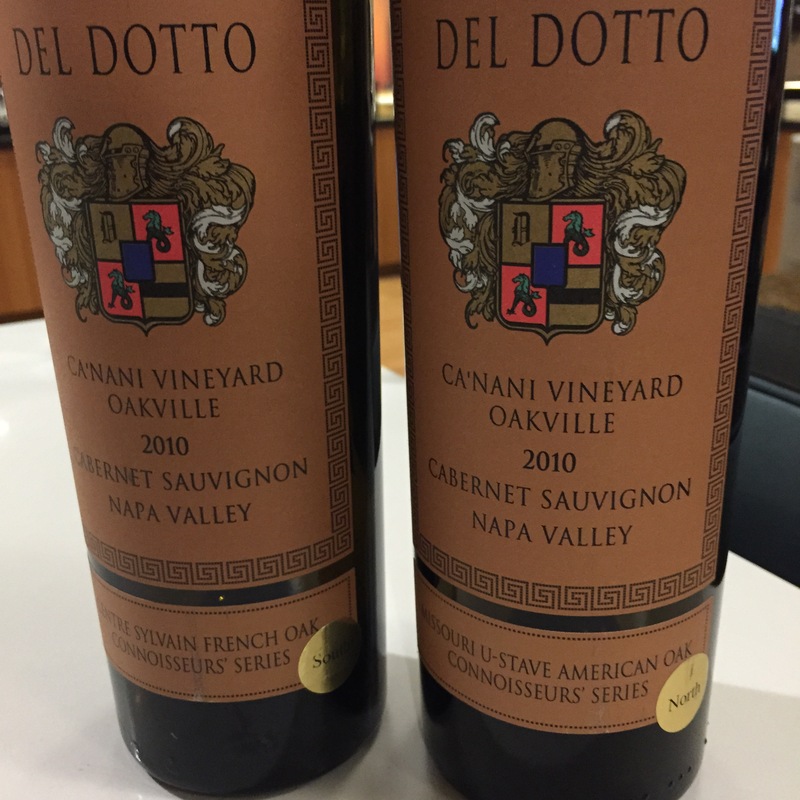 Flavor or taste – I thought both wines were very tannic with high acidity while the American was a little older tasting with some musty and charcoal hints. My wife felt the Missouri had hints of licorice. Winner. Missouri! Finish – we both thought the wines were fairly smooth with the edge going to the French. Winner. French! We did not decant these wines and wished we would have. Both of them opened up nicely during dinner. Particularly, the Missouri oak wine “calmed down” a bit as we dined. This helped it catch up to the slightly softer (from the outset) French oak wine. I actually finished the wines the next evening which many times is the best time for the wines. So I had a chance to compare one last time before final judgement. Conclusions – the winner is the French oak by a slight margin. Overall, to be honest we thought the wines were both disappointing based on the price. We have many favorites that are better than these wines and sell for less than half the price. Our recommendation- taste for yourself and let us know what you think. That is the fun and joy of wine. Cheers!